Nelli's Palazzo Vecchio Annunciation represents San Marco's traditions. Nelli champions the traditions of San Marco. 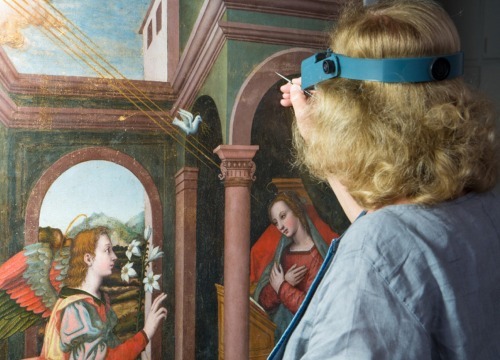 A 'new' Annunciation attributed to Renaissance painter Plautilla Nelli and her school has been restored by the Advancing Women Artists foundation and displayed at Palazzo Vecchio for the first time ever. The Annunciation was much-loved painterly theme for sixteenth-century artists, and Nelli, as an exponent of the School of San Marco who was aware of Beato Angelico's rendition, was no exception. You can tell by the angel's wings! Attributed to Nelli by US scholar Catherine Turrill, it is thought to be one of two Annunciations by the artist that Giorgio Vasari cites. Its twin painting, now in storage, is also attributed to Nelli and part of the Uffizi collection. Why is the Annunciation important? Nelli. Heir of Fra Bartolomeo's sizable drawings collection and a true Renaissance woman. 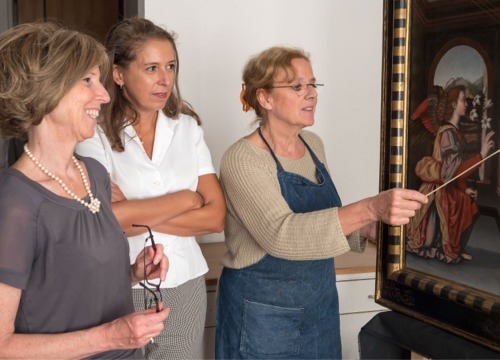 Museum curators and the mayor celebrate this 'new' Palazzo Vecchio painting. A revolutionary artist uses traditional symbolism.